During the event industry experts gave presentations on a number of safety products and safety features on sanitation trucks. Presentations were given by Safety Vendors: Preco, Lytx, Airflow Deflector, Ouster/Fleet Guide, 3rd Eye, Dur-A-Guard, Virgo Fleet Supplies, Rosco. Guests were then invited outside for an interactive hands-on demonstration of such technology. 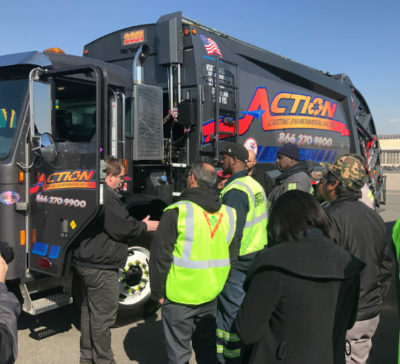 Action was one of the five trucks on site that gave folks an up-close look at the importance of technology in sanitation trucks. The Action demonstration highlighted the number of safety products safety features that our trucks are outfitted with. 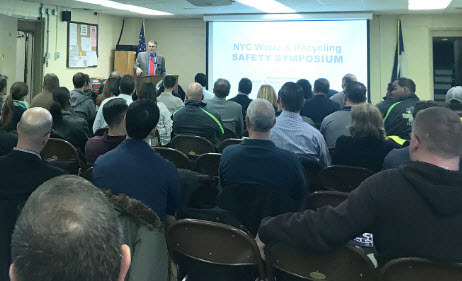 Waste Connections, Five Star, and DSNY were also on site to give attendees a tour of their trucks and their safety features.